'Going scuba diving in Tenerife' some aficionados will declare with surprise! To those in the know, the clear Atlantic waters, the sheer variety of sea life and amazing volcanic formations offer some of the best year round diving in the world. Novice or experienced, dry land or 'live aboard', Tenerife scuba diving offers a range of dives to suit all. 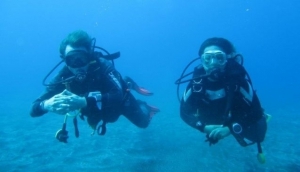 Friendly and helpful, it is a close knit community which prides itself on local expert knowledge on where to get the best scuba diving in Tenerife. Sshh..keep it quiet please, we wouldn't want it crowded like the other 'famous' places!